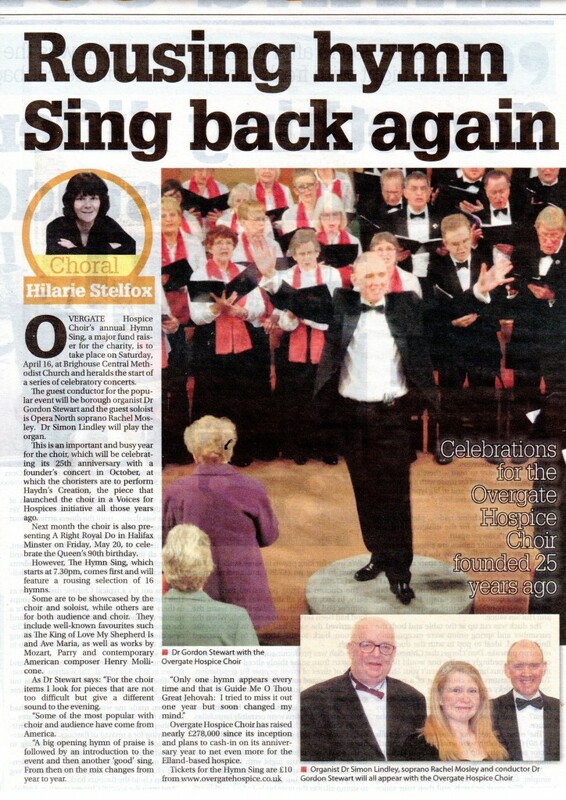 In and among his announcements and introductions at the 2016 Overgate Hospice Choir annual Hymn Sing at Brighouse Central Methodist Church, guest conductor Dr Gordon Stewart – the renowned and popular Organist of Huddersfield Town Hall – let drop that this year’s Hymn Sing would be his last as our regular guest conductor over the course of the past decade and a half. Gordon has conducted thirteen of these popular annual events since his first appearance in the Millennial Year, 2000. 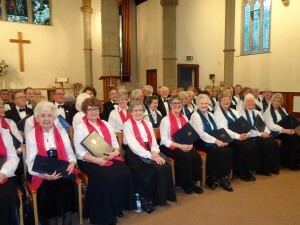 Conducted is perhaps an understatement, though he has certainly done that duty with immense aplomb and highly effectual and wholly enjoyable musical results that have raised a huge amount of money for the work of Overgate Hospice. Gordon has done far more than just conduct – he has planned programmes of great attraction and huge general interest and drawn audiences from all over the country, not just from Calderdale and the West Riding. 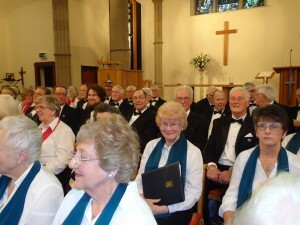 In the same way as he has himself shown us, Dr Stewart has brought with him top soloists who have evinced clearly their own Christian belief as well as outstanding musical excellence to add considerably to the ambience of each occasion. 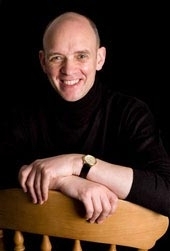 Dr Stewart’s considerable experience in directing and conducting for BBC Television’s Songs of Praise has made each Overgate occasion particularly special for us who labour in the musical vineyard month by month and year by year. For this and much more that he has brought to us in many other diverse ways, the Officers and Members of the Choir are profoundly grateful. 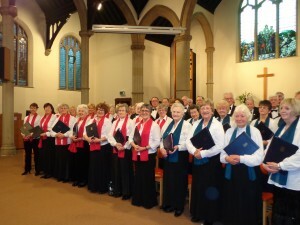 We hope during the course of the remainder of the Overgate Hospice Choir’s Silver Jubilee Year, 2016, to be able to find an opportunity of marking our great gratitude for his unfailing support in these special events over so many years. Thank you, Gordon, very much indeed. 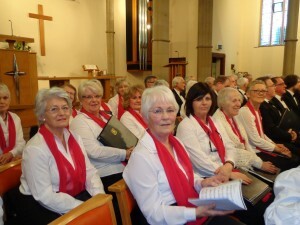 Our Choir Secretary is Lesley Henderson, pictured on the right in the photograph. She will be sharing the duties of the role with Kathie Rhodes, shown sitting on the left. 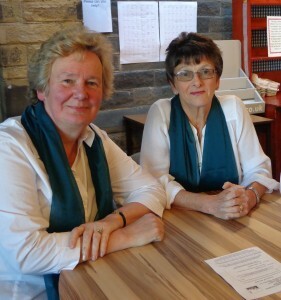 Lesley will be organising everything concerned with our concerts and Kathie will looking after membership and rehearsals. For ease of communication, the first point of contact will be Lesley and her telephone number is 01422 373252. 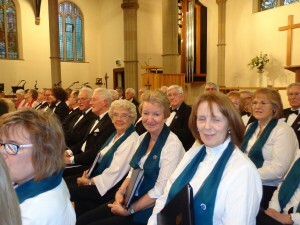 We shall be having a rehearsal on Wednesday 18 May at 7.45 in St. Jude’s Parish Hall. 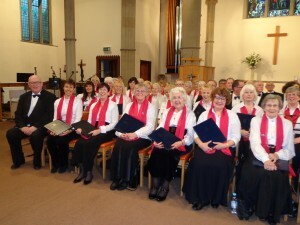 We shall also be having a rehearsal on Monday 16 May at 7.45 in Halifax Minster.